I have been making a few trips outside of the North Carolina state lines to Virginia for work and, as always, I am on the lookout for good local eateries. I usually jump on my phone and hit up Urbanspoon and Foodspotting to see what restaurants everyone is talking about in the area. I have run across some decent places so far but nothing worth blogging about until I went up to South Boston, VA a few weeks ago and found out about a place called Caffe Peroni in downtown South Boston. The 95% Urbanspoon rating was what stood out first to me about Caffe Peroni followed by one or two reviews which mentioned the “slow food movement” that Caffe Peroni has incorporated into its cooking so you can sit back and enjoy the restaurant instead of “being served, billed and thanked in less than 20 minutes” like Bath Piatti wrote in their review on Urbanspoon. I had about 2 hours before I had to be anywhere and it sounded like a good way to check out some local food and kill some time. Caffe Peroni has been open in South Boston since 2008 and the owners’ intention was to recreate the Italian home cooking that they remember from their childhood. They start every meal from scratch when ordered plus the chef cooks it right in front of you in an open air kitchen near the dining room (I took a picture of this but it turned out blurry). As soon as I stepped through the door at Caffe Peroni, I had the feeling it was going to be a neat place to eat at. There was a young couple already seated enjoying an early dinner which was surprising because it was 4:45 p.m. and I tend to beat even the early birds when I eat dinner while out on the road. The space that Caffe Peroni fills reminds me a lot of an old bookstore minus all the books. It had a very relaxed atmosphere where you could come do some work on the computer while having a coffee or just curl up and read a book on one of their couches while munching on a little bit of gelato. 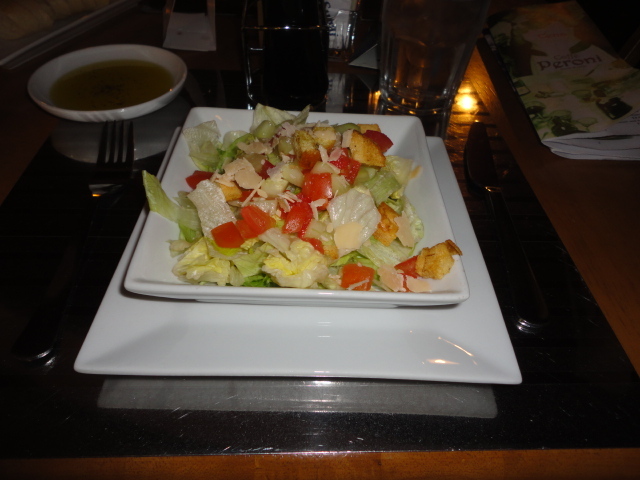 I ordered the Insalata della casa ($3.95) which came with a bottle of both olive oil and balsamic vinegar as a dressing. I believe that you can choose from a variety of dressings but I was trying to be health conscious since I already knew what my entree was going to be. The presentation of the salad was nice and the ingredients were fresh as well as plentiful which is what I look for in a salad. They diced the tomatoes & onions then tossed them together with some Parmesan and croutons on then laid it over the lettuce. Each bite had a little bit of everything from the salad in it. I might be doing this at home from now on when I make salads. I ordered the Porcini Ravioli cremolati which is a ravioli dish made with porcini mushrooms and then placed in a heavy cream sauce. 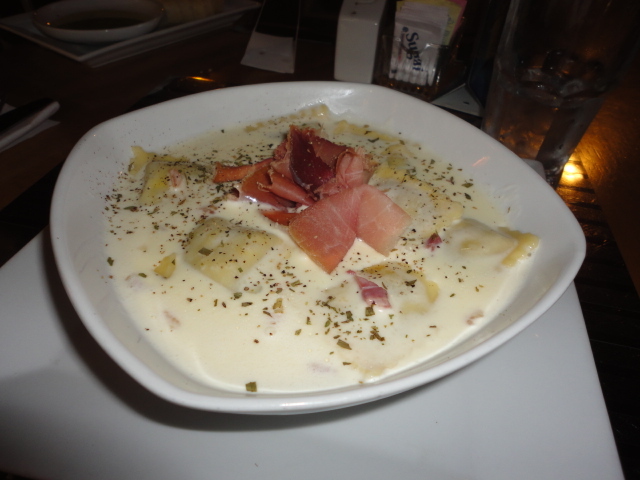 Caffe Peroni’s version adds a good amount of pancetta and prosciutto making it a little bit heartier that usual. The prosciutto that they added wasn’t the thin, sticky type that you find in the grocery store or on sandwiches from national chains. This was close to the thickness of sliced ham for a sandwich and it not only added a delicious salty taste to the dish but also added a great texture to contrast the softness of the ravioli. (NOTE: Prosciutto dipped in cream sauce can become heavily addicting.) The pancetta in the dish mainly sunk to the bottom of the cream sauce so I didn’t start getting to mix its taste in until about halfway through the meal but it was worth it when I hit the proverbial gold mine of pancetta. The highlight of the dish for me was the ravioli which was cooked al dente but was still soft enough that a knife was unnecessary. I have been a big mushroom fan since back in the day more than likely because I saw Mario eat them while trying to save peach and gain superpowers. In hindsight, I am pretty sure that Mario was munching on hallucinogenics the entire time as its the only logical explanation for the storyline…but I digress. The filling had a lot of taste that was overshadowed a bit by the cream sauce but I was able to pull some out of one of the pockets and it had a fantastic taste on its own which could allow it to be served with a lighter sauce if you weren’t feeling the cream. The dish was loaded with 16-20 ravioli pieces making it a behemoth of a meal and I was very surprised with myself that I was able to finish it. Everything about my experience at Caffe Peroni was amazing. The service was outstanding. The food was on target. The atmosphere was friendly and warm. The holiday lights in downtown South Boston were stunning in that Mayberry sense that a small town can have. I couldn’t have asked for a better overall experience at a restaurant and I have since recommended to various couples in the Greensboro area that I know to head up to South Boston one night on a date night because it would be well worth the 30 to 45 minute drive. Tucked away in a little corner of the Eastgate Shopping Center in Chapel Hill near the CVS is a little gem of a restaurant called Carmine’s. As you walk down the sidewalk, there are tables outside and lush hanging plants, giving a feel of a European cafe. Upon entering the restaurant, you will hear songs from the Rat Pack playing in the background. Big booths give a sense of privacy or you can eat at a table if you prefer. 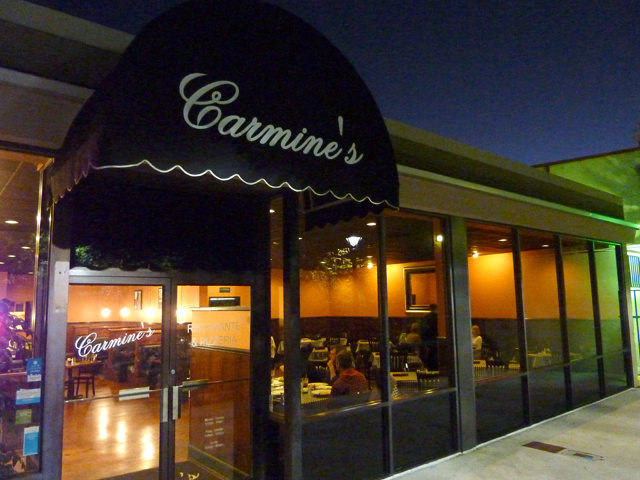 I like going to Carmine’s because it seems like a good date night place to spend with my husband. We have eaten here several times and each time have been treated very well by the knowledgeable and friendly staff. 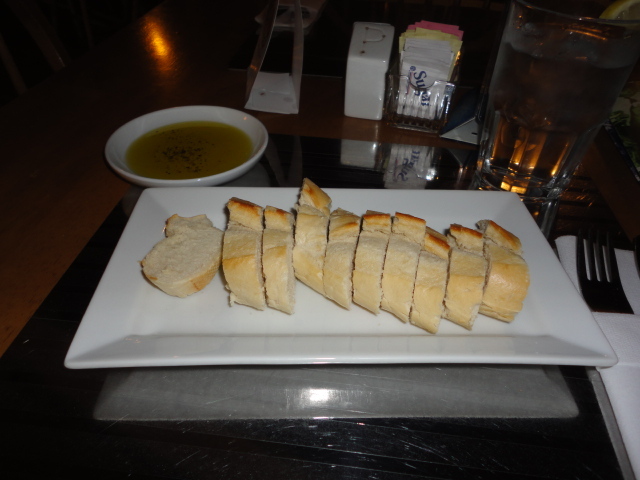 The other night, we went to eat at Carmine’s and ordered the Bruschetta for an appetizer. 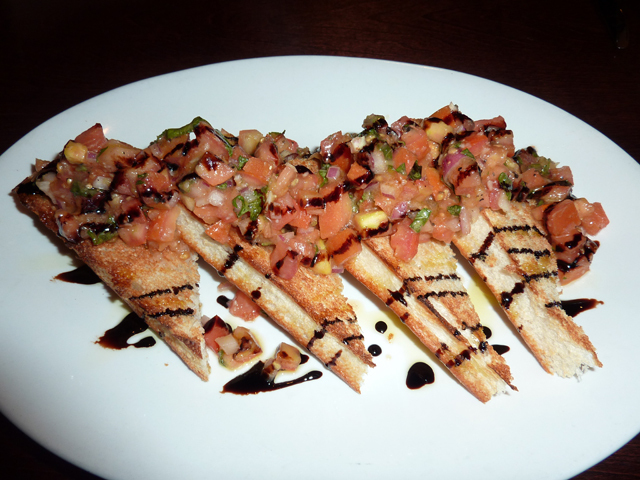 Large, thick slices of toasted bread were topped with fresh tomatoes, onions, basil , a little bit of corn and olive oil. The balsamic vinegar was drizzled over top. It was an explosion of flavor in your mouth. Wonderful! I ordered the Penne Alla Vodka, which is the Penne pasta served with a creamy tomato and vodka sauce with just a little bit of spices added to the sauce. It’s a rich and creamy, soul-satisfying dish. 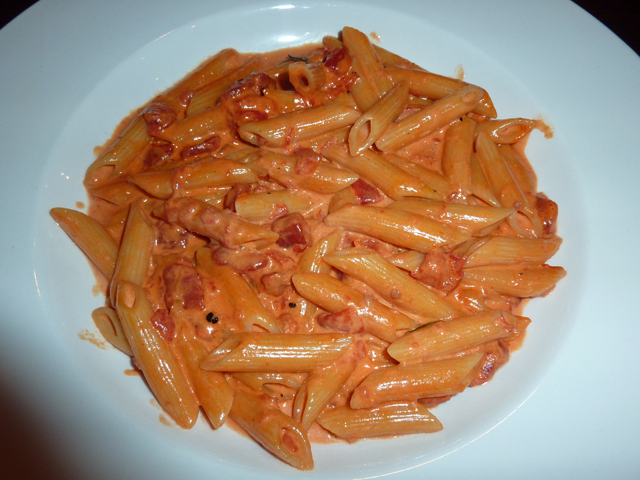 I must admit that I think I liked the Pasta Antonia dish that my husband had last time we were here, which is very similar to the Penne Alla Vodka, but that dish also has sun-dried tomatoes that intensify the tomato taste, mushrooms and spinach. You can also add a protein, such as chicken or shrimp to either of these dishes. My husband had the Eggplant Parmigiana. The eggplant was sliced to nice, manageable pieces and are coated in fine bread crumbs and fried to a toasty golden brown. 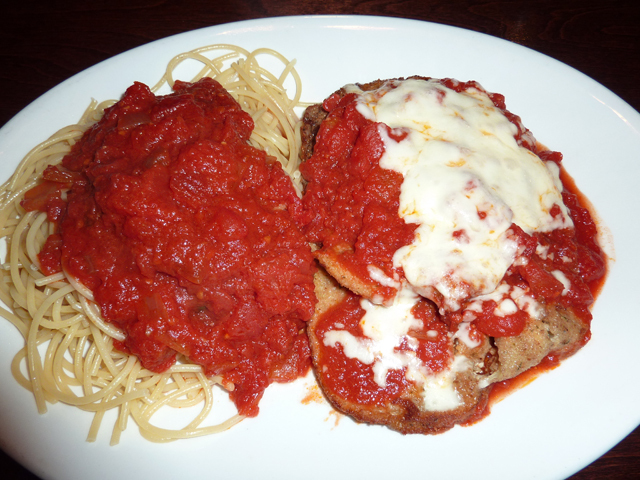 The pieces were coated with a marinara sauce made with San Marzano tomatoes, and melted mozzarella cheese. It was served with a side of spaghetti and the same marinara sauce. This is Italian comfort food at its best. We also had a side house salad with mixed greens, red onions, tomatoes and cucumbers and nice chunks of crispy croutons with their creamy Italian dressing. It was a good accompaniment to the pasta dishes. We thought we were too full for dessert, but decided to try the cannolis, because they sounded too good to pass up. 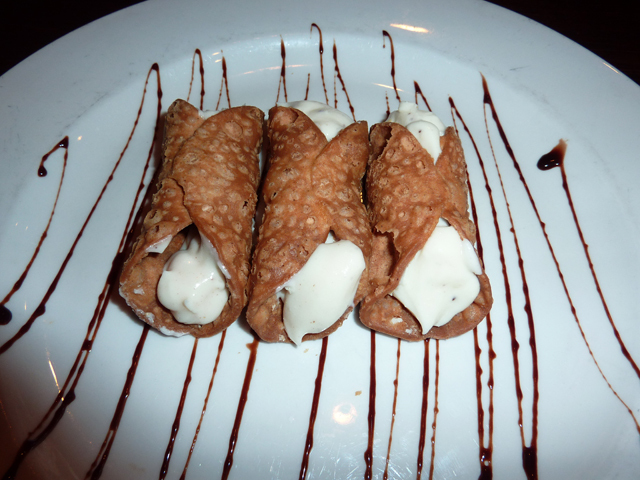 They are made straight from Italy and are three nice sized cannolis with a rich creamy ricotta cheese filling. The fried shells had cinnamon in them and I must say these are as good as the ones I used to get in Little Italy in Cleveland. The pizzas at Carmine’s also look really great, but we’ve been so excited to try all the pasta dishes that we still need to come back again to try a pizza. The owners of the restaurant, Darius Robustelli and John Runge, grew up in Upstate New York and worked at one of the owner’s father’s Italian restaurant. No wonder they know what they are doing! Carmine’s is open seven days a week. They are located at 18-16 East Franklin Street in Eastgate Shopping Center in Chapel Hill. Call (919) 929-4300 or (919) 929-4350 for reservations or for more information. Pittsboro may be a small town, but it is rapidly growing. Along with this growth, new restaurants are establishing themselves and changing the landscape of this town. As a resident in Chatham County, (Pittsboro is the county seat of Chatham) I am thrilled to see more places open, especially ones that are not the standard burger and fries joint. One of the newest places to open is the Greek Kouzina (Greek Kitchen) on East Street (Business Highway 64). The restaurant opened in a two story concrete building that houses the YMCA and the Chatham County Economic Development Corporation amongst other organizations. The bright sunny yellow walls and the deep sea blue reminds you of Greece with its warm climate and ocean. 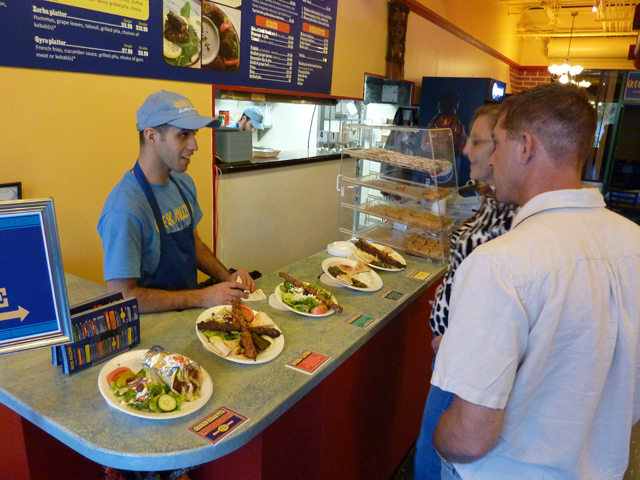 You are immediately welcomed by the friendly staff as you get in line to order from the counter. There are sample plates to help people get more familiar with the Greek dishes. I have already eaten here three times in two weeks. The first time I ordered the Greek Lamb Pita. The lamb was seasoned with oregano, pepper, and other spices, giving it a rich taste. 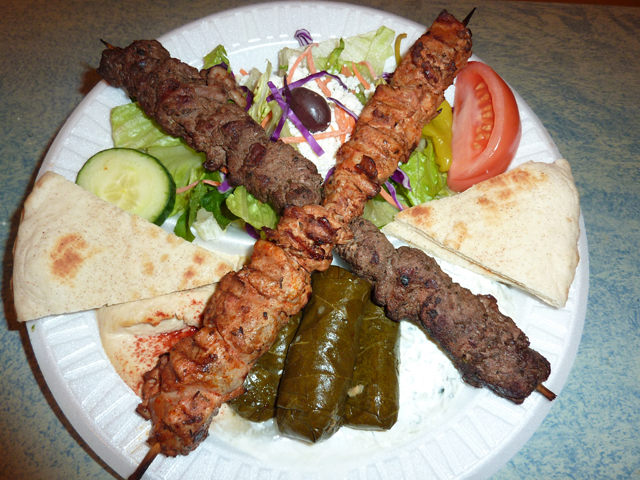 The lamb is grilled and served with lettuce, tomato, tzatziki (a yogurt-based sauce with cucumbers and onions) sauce and onions on a rolled up pita. It is served with a side of Greek salad. The sandwich was very satisfying to the soul. The very warm and welcoming owner, Mohammed Matarieyeh, also suggested trying a piece of baklava. They have several great desserts, including both a walnut baklava and a pistachio baklava. It depends on what your personal taste is, but I like the pistachio the most. Mohammed used to work at the Greek Fiesta in Cary. The Greek Fiesta has a very similar model to the Greek Kouzina, where you order at the counter and get served at your table. You can see that Mohammed is really open and friendly and he is excited about owning his own business. Mohammed said, “I like to think of my customers as my extended family.” I agree that he does make you feel like you’ve made a new friend. The second time I came to the restaurant, I had the Falafel Pita. The falafel was nicely fried to a golden crisp and had the perfect amount of cumin and coriander in it. It was served with hummus, lettuce, tomatoes and tzatziki in a pita. Again, I had another piece of the baklava. It’s hard to resist! The Kouzina Platter is a great choice. You can order one or two kabobs. The last time, I decided to order the Kouzina Platter. The platter comes with a Greek salad, hummus, stuffed grape leaves, tzatziki, grilled pita points and a choice of either the chicken or steak kebab. I chose the steak kebab. The pieces of meat were grilled on the skewer and practically fell off in my mouth because they were so tender. The side dishes are decent, but not overly memorable. The hummus was good, but I like mine with a bit more garlic in it. That’s just my personal preference. The stuffed grape leaves had rice with mint, dill, chopped onions and olive oil with a bit of lemon juice in them. They were quite good, although one of the ones I had was a little bit on the soggy side. The salad was served with green lettuce, red onion, banana peppers, shredded carrots, shredded cabbage, cucumber, Kalamata olives and some feta cheese. The atmosphere is quite casual here, but that is typical in most Pittsboro restaurants. The prices are also quite reasonable. 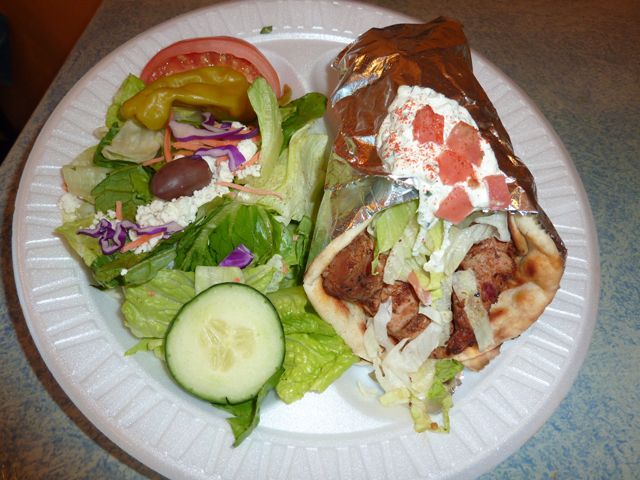 You can order a Greek veggie pita for just $4.99 or spend up to $11.99 for the Kouzina platter. And the big plus in my book is that the Greek Kouzina is open on the weekends and later at night so those of us who work in RTP and commute back to Chatham County can actually go home first before venturing over to Pittsboro for dinner. The Greek Kouzina also has a substantially large meeting room in the back of the restaurant, so I think there will be many meetings in my future that will be held at this restaurant. 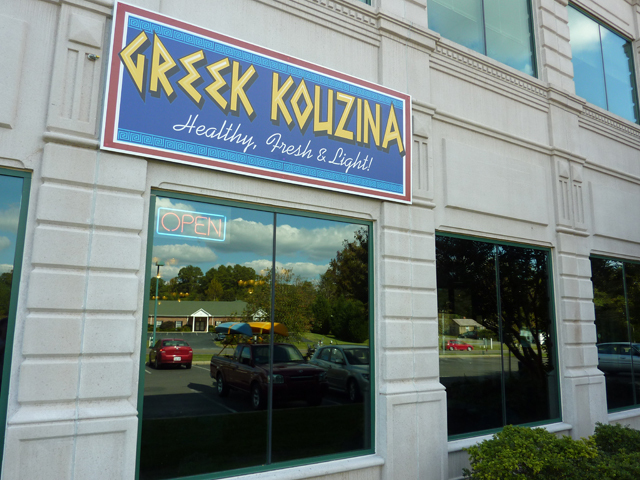 The Greek Kouzina is located at 964 East Street in Pittsboro and is open Sun-Thurs from 11 am to 9 pm and on Fri-Sat from 11am to 10pm.